Moscow is truly in the foodie spotlight. RBTH picks the city's best restaurants, whether you fancy traditional Russian cuisine, Asian – or Italian. Concept: the restaurant has an impeccable view of the capital, which mesmerises those lucky enough to see it from the 62nd floor of the Federation Tower on Krasnopresnensky. 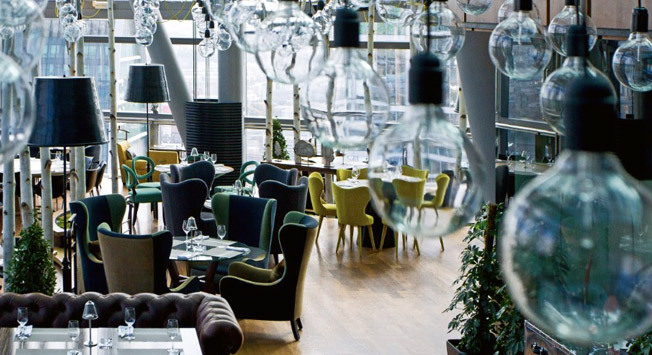 The design of the highest restaurant in Europe can be characterized as ultramodern, cosmic, and eco-friendly. Who should go: those who would like to see an amazing view of the city. Dishes worthy of attention: the most important thing at Sixty is by no means the food, but the company with whom you will find yourself in the “society column.” The Italian Chef Carlo Grecu’s team is responsible for the kitchen. You absolutely must order the beef borsht; the Italian promises to prepare it better than the locals. Location and hours: 12 Presnenskaya Quay, 60th floor of the Federation Tower, Moscow City. Hours of operation: from 12:00 to the last guest. Concept: the concept of the newly opened restaurant corresponds completely to its name with its exclusive use of seasonal products of Russian natural agriculture. The restaurant’s suppliers make selections from the best farmers in the country. Who should go: admirers of the most famous Russian restaurateur abroad – Anatoly Komm – and Mark Kaufman, the creators of the Russian water brand. Dishes worthy of attention: it is, of course, worth ordering the kholodets (meat in aspic), Olivier salad, or dressed herring (herring under a fur coat) – all of the seasonal offerings are extremely delicious. Location and hours: Strastny Blvd., bldg. 8a; hours: 12:00 – midnight. Concept: the actor Robert De Niro and guru of Japanese cuisine, Chef Nobu Matsuhisa, opened a location of this cult restaurant in Moscow. The French Chef Damien Duviau is responsible for the Moscow kitchen. The interior, dishes, and personnel have all been very carefully chosen. Who should go: those who love seafood and red king crab. The restaurant is good for business negotiations as well as for late romantic evenings. The tables are situated somewhat apart from each other, which makes it possible to have private conversations of a business or personal nature. Dishes worthy of attention: as the portions are quite small, you can try everything in one visit: the swordfish, sashimi, and two or three desserts. The establishment is open from 13:00 to midnight. Concept: a restaurant “on the heights” (on the roof of the RAS building): haute cuisine, a stylish interior, and a menu for any taste. Who should go: those who are accustomed to conducting business negotiations in exclusive settings. For the sake of these settings, you are even offered a separate room. Dishes worthy of attention: as with many restaurants in the capital, the menu offers guests a “solyanka” of world culinary achievements: there is Italian, Russian, and Mediterranean cuisine, as well as, of course, the Japanese cuisine that Muscovites hold in such high esteem. The building of the Russian Academy of Sciences (RAS). Concept: the restaurant is situated on the 29th and 30th floors of the Hotel Ukraine. The restaurant is nearly empty during the day but is popular among gourmets in the evening. Who should go: whoever wants everything at once: a panoramic view of the city, an ideal interior, and Italian cuisine beyond all praise. Dishes worthy of attention: the young Executive Chef Kristian Lorentsini is a Tuscany native. In Kristian’s words, he is “just preparing the family’s recipes,” sharing the taste and charm of culinary traditions. Location and hours: 2/1 Kutuzovsky Ave., bldg. 1, Hotel Ukraine, Radisson Royal Hotel, 29th floor. Hours of operation: from 12:00 to 1:00 for the kitchen, until 2:00 for the bar. Concept: a 1930’s style American bar. If you come alone, you can easily find new acquaintances on the road to the bar and join one of their loud groups. Who should go: those who love crowded places, smiles, and a relaxed atmosphere of noise, smoke, music, and the vapors of alcohol. Dishes worthy of attention: evening is the time for cocktail parties and you can make use of an inexpensive (US $11) business lunch that enjoys great success with all of the office workers of White Square near the Belorusskaya station. Average bill: US $72, book a week in advance for a table on Friday or Saturday. Location and hours: 10 Butyrsky Val St.
Concept: a merry “drinking” establishment. This is not a restaurant or a bar, but something in-between. In the evening young guys and gals run to Karabas in search of a good place for a pre-party – and many remain till morning. Dishes worthy of attention: cocktails made by the unhurried Karabas bartenders are only good if they’re alcoholic; therefore do not experiment with the healthy option. Average bill: US $43-58, book in advance for weekends. Location and hours: 18Ð± Lev Tolstoy St., http://www.carabasbar.ru; hours of operation – from 12:00 to 06:00.